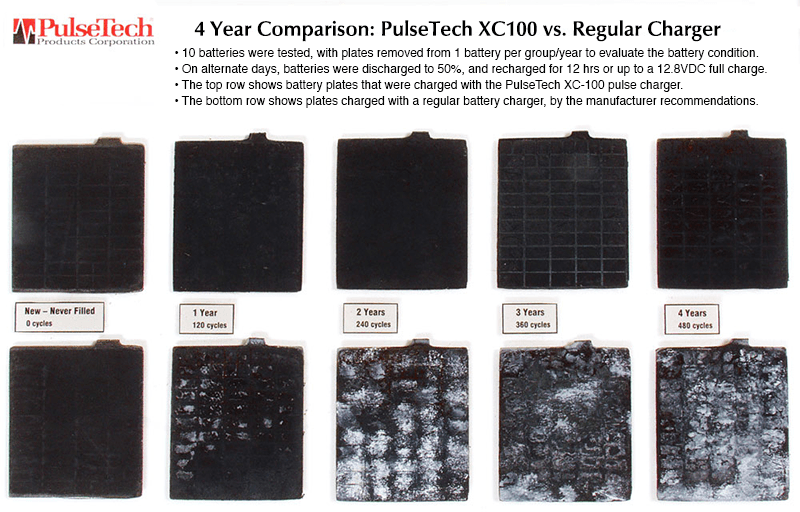 PulseTech's new Xtreme Charge XC2 combines the capability of two Xtreme XC-100-P Chargers in one convenient unit! Perfect for RVs or boats, with separate deep cycle and starting circuits. The XC2 can charge both batteries at once. Also perfect for 24 volt battery banks that must be charged in two 12v sets! 5 stage battery charging that determines the optimal bulk or float charge rate based on the voltage and the amperage acceptance of the battery, an industry first. The Xtreme Charge XC2 doesn't take shortcuts in the design either, featuring the same industrial-quality construction and the same detailed LED status lights as the XC-100-P. You can tell at a glance what charging stage each connected battery (or 12v set) is at, and know when they've reached full charge. You won't find an easier-to-use dual charger anywhere. PulseTech has taken all the guesswork out of battery charging and conditioning. The XC2 has no buttons or adjustment switches: Just plug it in, attach your batteries, and let it go to work. And thanks to PulseTech's state-of-the-art pulse conditioning technology, leaving your batteries on the charger after they reach full charge actually improves their condition! How many amps per bank? Are they made in the USA? Thank you for your questions! We've updated the product description with the specifications.